With production just a few months out, dealers are finally able to order the 2015 Ford F-15o today. Base prices and configurations have been confirmed, with the highest-trim trucks commanding a $3,000 premium from last year. But every variant has more new features than aluminum construction. Here's the breakdown of each 2015 Ford F-150 standard trim setups and every new standard feature for next year. This is not an exhaustive list of toys on these trucks; just what's been added to the base-price configuration for 2015. Prices include $1,195 "destination and delivery" charge, which is unchanged from 2014. Standard Configuration: Regular cab, rear-wheel drive, 6.5' bed. New Standard Features For 2015: 4.2" LCD screen in center stack, 2.3" screen in instrument cluster. Telescoping steering wheel, two extra speakers, spotter mirror, extra grab handle. New Standard Features For 2015: Everything from XL plus– BoxLink (adjustable tie-down anchors in bed, reinforcements to cargo box, power tailgate lock. Standard Configuration: Extended cab, rear-wheel drive, 6.5' bed. New Standard Features For 2015: Everything from XLT plus– 8" LCD screen in instrument cluster, LED bed lighting, heated and cooled seats, power folding mirrors, rear-view camera. Standard Configuration: Crew cab, rear-wheel drive, 5.5' bed. New Standard Features For 2015: Everything from Lariat plus– LED headlights and taillights, mirror spotlights, more LED cargo lighting, two 400 watt power inverters (AC plugs) blind-spot indicators, push-button start. New Standard Features For 2015: Everything King Ranch got plus– inflatable rear seat belt, multi-contour massaging front seats, real wood interior pieces, heated rear seats, heated steering wheel. The 3.7 V6 is being dropped as standard equipment altogether in place of a new 3.5 V6. Upgrading from the new base engine to the premium 3.5 EcoBoost turbocharged V6 will cost an additional $1,995. Moving from the old 3.7 to the EcoBoost in 2014 was $100 more than that. Going from the new base 3.5 to the also-new 2.7 EcoBoost will be a $495 upgrade. 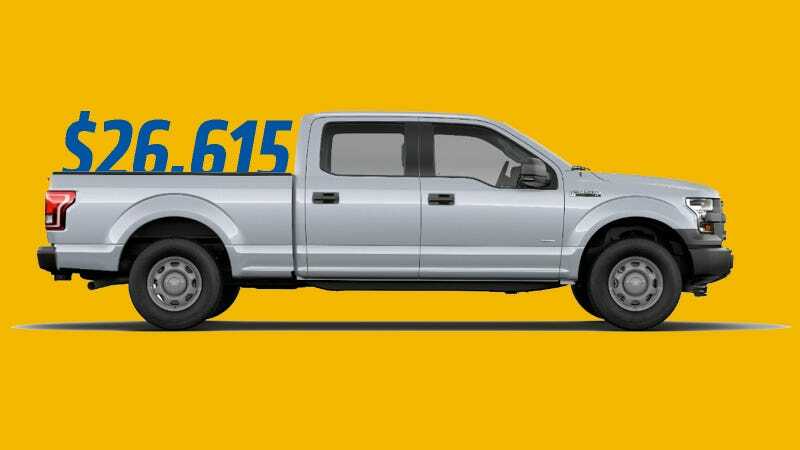 The 6.2 V8 is no longer an option for the F-150. Naturally, 4x4 and long-bed options will increase base price for all trims. USA Today says the XL, XLT, and Lariat make up 85% of F-150 sales but Doug Scott, Ford truck group marketing manager, told them the range-toppers will sell strong out of the gate. "[Early customers will] want the higher-end trucks. That's been the history. That's where the most new tech is found, so we expect the same rich mix at launch as we have seen in the past." All trim levels will be launching at once (end of this year), and as with previous years most new features in higher-trim trucks will be available as options in lower trims.